A: No, return flow to the Root River will protect water quality because the water will meet all state and federal water quality limits. For some parameters, return flow water quality will be better than that of the river. Waukesha’s discharge to the Root River in Franklin will have stricter permit limits than existing area wastewater discharges to the Root River and other rivers, or directly to Lake Michigan. Waukesha’s Clean Water Plant uses advanced treatment processes that are matched by only a handful of municipalities in the state. Waukesha will also provide water quality monitoring to encourage reduction of pharmaceutical and personal care products in the return flow. In approving Waukesha’s application, the Great Lakes Compact Council concluded unanimously that the program’s return flow will actually benefit the Root River. You can learn more about their findings here. Back to top. Q: What will the impact be on fish in the Root River? A: Waukesha’s return flow will help improve the fishery and support fish stocking programs in the Great Lakes Basin. The base flow of the Root River has been reported since 1966 to be too low to support water quality, recreation, and fisheries goals in the watershed. The Department of Natural Resources and the Southeastern Wisconsin Regional Planning Commission have explored adding to the volume of water in the river for decades, but have been unable to augment the river’s flow because the costs were too high. During the summer and fall, some sections of the river have very low flow, which does not support fish migrating from Lake Michigan. Increased flows would improve the amount of river habitat in the Root and aid the fishery, particularly during fall spawning runs of salmon and trout. At the Root River Steelhead Facility, for instance, the clean water of Waukesha’s return flow will increase river levels by 6.6 inches during low flow periods. Waukesha will borrow (and return) around 8.2 million gallons a day from Lake Michigan. This may seem like a large amount, but during high-flow events, the return flow is inconsequential compared to the total volume of water in the river. For example, during the June 2008 storm, the Root River flow measured a little over 5.2 billion gallons. Waukesha’s added outflow would have meant an increase of just 00.15%. Back to top. Q: Is there a risk of untreated or partially treated wastewater from Waukesha ending up in Lake Michigan or the Root River? A: No. There will be no risk of a sewer overflow to the Great Lakes from Waukesha. Unlike some communities with sewer overflow problems, Waukesha has separate storm sewers and sanitary sewers, so its Clean Water Plant is not overwhelmed by storm water. In addition, the return flow pump station is designed so that only fully treated water can reach the pumps and pipes that will send the return flow back to Lake Michigan. Run-off and other upstream communities may have a potential adverse impact on the Root, but Waukesha is legally bound by permit requirements and the Compact to return only clean water to Lake Michigan. Back to top. Q: Is it unusual for a municipality to discharge to a river? A: No. 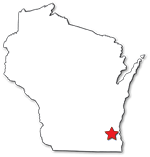 About 473 – or 94% – of the more than 500 municipal wastewater treatment plants in Wisconsin flow into rivers. Only 22 flow directly to the Great Lakes and 8 flow directly to inland lakes. Federal and state regulations protect water quality and communities that are downstream of municipal discharges, and Waukesha’s return flow will meet all permit limits. Only a handful of communities in Wisconsin have treatment processes that are as advanced as those used by Waukesha’s Clean Water Plant.